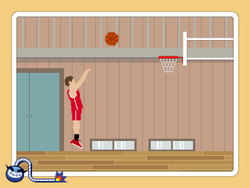 High Hoops is one of the Microgames in the Sports folder in WarioWare, Inc.: Mega Microgame$!. It reappears in WarioWare Gold. A man holding a basketball continuously jumps next to a basketball hoop. 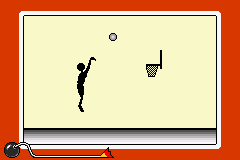 The player must press the / button when the man is at the highest point to shoot the ball into the basket. As the difficulty increases, the hoop gets higher, making it harder to hit. 1st level difficulty: The hoop is a bit low. 2nd level difficulty: The hoop is slightly high. 3rd level difficulty: The hoop is now higher. This page was last edited on April 3, 2019, at 22:25.